Be covered properly for your next holiday when you have a kidney condition. Find out more about our travel insurance below. When you’re ready, get your quote online or talk to us today. Looking for travel insurance when you have a kidney condition can seem daunting. But it really needn’t be. 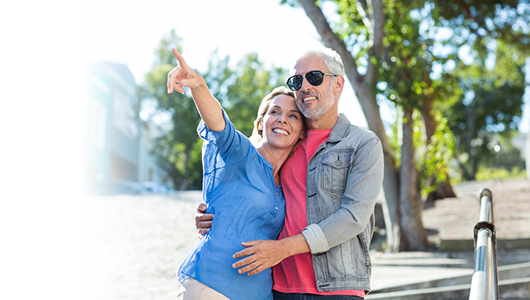 With our tailored policies, you can have proper protection for your medical condition and your travel needs. We can do it at a level that suits you, including any little (or big) extras that you have in mind. Whether your heart is set on a beach-side swoon or a weekend city-break, a cultural feast or a cruise, you can be confident. For if there’s a mishap, we’re on hand to help. It’s probably one reason why we’ve been voted the nation’s Most Trusted Travel Insurance Provider in 2017 and 2018*. You can get your tailored quote for travel insurance online here, or talk to a helpful advisor today on 0800 033 4902. Why do I need travel insurance for my kidney condition? When you’re travelling and have a medical condition, you probably won’t want to leave things to chance. Emergency medical bills abroad can set you back thousands of pounds, so why expose yourself to that risk? What types of kidney conditions can be covered by travel insurance? Good quality travel insurance doesn’t only cover you against medical costs. It also protects you against unwanted surprises such as lost luggage delays, flight cancellations and loss of passports, valuables and cash. Having to make a claim actually happens more than you might think. In 2017, 1 in 20 people claimed on their travel insurance with us**. One of the best things about a holiday is that carefree feeling. A tailored insurance policy from Staysure can give you a hand getting there – as well as practical support if something does go wrong along the way. You can get your quote online, or if you have any questions talk to us today on 0800 033 4902. What does our kidney conditions’ travel insurance cover? I am awaiting/having dialysis, can you cover me? Yes, we just won’t be able to cover any of your pre-existing medical conditions. This means that you will still be covered for medical emergencies and cancellation, as long as they aren’t related either directly or indirectly to your pre-existing or undiagnosed conditions. You’ll also still be covered for everything else – including baggage, lost money and passports. Do I need I take my European Health Insurance Card (EHIC)? If your trip is to a country within the EU or Switzerland, Iceland, Norway or Liechtenstein, then yes. In fact, our insurance requires you to take an EHIC with you if you’re travelling to Europe. An EHIC entitles you to subsidised or free healthcare in member countries when you use a state healthcare provider (like our NHS). If you need dialysis, for instance, then EHIC should cover you, provided you are in a state hospital and have pre-arranged the treatment. If you use your EHIC, and have bought your policy with us, then you’ve had to pay a subsidised fee for healthcare, we’ll remove the excess fee for medical emergency claims. But while an EHIC is useful, the NHS advises that you get proper travel cover too. An EHIC is not a travel insurance policy. EHIC won’t cover you for things that aren’t directly related to emergency medical treatment. Unfortunately, that includes getting you back home safely. So if you have to be flown home in a helicopter ambulance, that’s not covered by EHIC and it’s likely to be very expensive. Nor will your EHIC cover you if you lose belongings, experience delays or have to cancel or break off your trip. To help us provide you with kidney conditions’ travel insurance, you’ll need your GP’s clearance to travel. We can’t provide you with the insurance unless you know your doctor would be okay with your travel plans. You’ll also be asked to complete an online medical screening. It’s painless and easy to follow. If you’d rather complete it over the phone, please don’t hesitate to call us. You’ll simply be asked some questions about your kidney condition, as well as any other medical conditions you have. It’s vital that you give us complete and accurate answers so we can cover you properly. If you have a medical condition and you don’t disclose it to us, it would mean you’re not covered if you need to claim. You may find it helpful to have details of any medical conditions on hand during the process. But don’t worry – the medical screening is completely confidential and it won’t take long. • What is specific name of the medical condition? • Is the function of your kidneys impaired? • How often you are being monitored? • Are you on dialysis? • How many (if any) unplanned hospital admissions for this problem you have had in the last year? • Are you currently awaiting a kidney transplant? • How long it has been since you had your transplant? • Have you had any episodes of rejection within the last year? • Was the kidney donated by a living donor? • Have you been admitted to hospital in the last 12 months for treatment related to your transplant? You can get your quote online now, or you can call us 0800 033 4902. I’m travelling with my partner and my children, who don’t have medical conditions. Can they be covered with me on the same policy? Yes. Quite a lot of people do this, because it helps prevent costly ‘gaps’ in the party’s insurance. If you have to cancel your trip because of your medical condition, and if you’re all on the same policy, everyone will be covered for your cancellation. If you are all on different insurance policies this may not be the case. I’ve got an annual insurance policy and now my medication has changed. Do I need to inform you? We need to know about any changes to your kidney condition or new conditions, or any other change in your health. If this isn’t disclosed, your insurance policy won’t cover you properly. Do tell us as soon as possible and we will see if the policy can be adjusted. This may mean an additional premium. We think you’ll agree it’s worth doing it right – in the long run it can save you a lot of angst and cost. Get a quote in minutes and tailor it to you and your family’s medical and travel needs today. Call us on 0800 033 4902, or get your quote online. * Moneywise Customer Service Awards 2017 & 2018, based on the biggest survey of financial consumers in Britain.